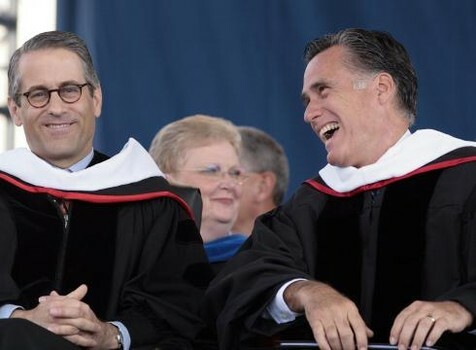 Last weekend’s Liberty University commencement speech brought us Republican presidential candidate, Mitt Romney, at his most amusing. It had been much discussed that this would be Romney’s opportunity to close ranks and reach out to conservative evangelical Christians who, during the traveling circus that was the Republican Party’s primary race, were very strongly opposed to him. Hence Romney’s choice to speak at the largest evangelical university in the country. Declaring the importance of religious values – check. Trying to establish common ground between Christianity and Mormonism without ever mentioning the word Mormonism – check. Spicing his speech up with quotations from Jerry Falwell and CS. Lewis – check. Proclaiming that America is based on Christian values – check. Announcing that marriage should only be between a man and a woman – check. What makes all of this phony Christian ecumenism so amusing to watch is that, in essence, Mormons believe that non Mormons will go to hell after they die (unless, or until, they are posthumously baptized into the Mormon church), and Christians believe that Mormons belong to a cult and are therefore going to be sent to hell (no posthumous salvation there, though). It is also amusing to watch Romney quote martin Luther King Jr. As a supposedly faithful follower of The Church of Latter Day Saints, Romney must have (like all other Mormons) believed up until 1965 that African Americans were still under the Curse of Canaan – a filthy racist teaching that prevented African Americans from even entering Mormon churches until 1978. This dramatic reversal, by the way, came after Mormon Church leaders had a religious “revelation” that year, which “revealed” to them that African Americans were not cursed after all. Somehow, despite the ecumenical mish-mashing of faiths and the religious flip flopping about civil rights and ancient curses, we are to believe Romney when he speaks about the consistencies of moral religious certainties. In light of Romney’s many self contradictions and consistent inconsistencies, it seems that he has, in fact, learned quite a bit from his religion. It had been funny enough to watch evangelicals criticizing Romney for flip flopping during the Republican primaries, but to see the same evangelicals flipping onto Romney’s side as he flops onto theirs is pretty hilarious.